What happens when a motorized linen and laundry cart isn’t the solution for you? In previous blogs, we’ve elaborated on the wide array of versatile motorized cart solutions for preventing musculoskeletal disorders (MSDs) common in the hospitality and healthcare industries, but we also understand that every application is unique and no approach to a transport solution should be one-size-fits-all. For linen and laundry applications that require an approach different from outfitting staff with an entire fleet of motorized carts, here’s what tuggers have to offer. What are tuggers and how can they make work for linen and laundry services employees safer and more efficient? The ergonomic motorized tuggers provided by Electro Kinetic Technologies are part of a transport strategy that operates similar to a truck pulling a trailer. 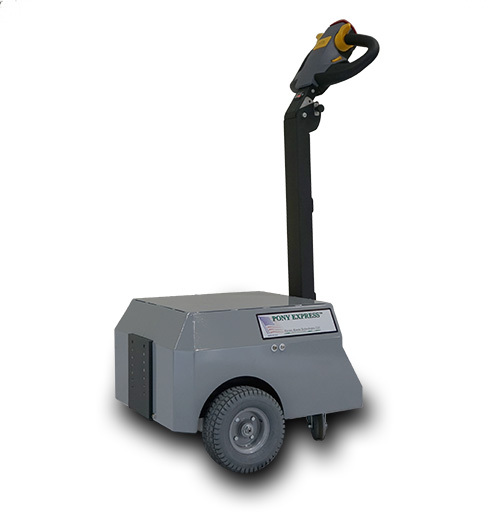 Just as a vehicle with high enough towing power can hitch up to a trailer and pull it wherever it needs to go, a tugger hitches up to a cart within its payload capacity and transports that load while eliminating any of the harmful MSD-causing push-pull forces an employee will otherwise experience. Within our line of tuggers, there are three different levels of payloads, each capable of moving over a thousand pounds of supplies. The tugger’s generous payload capacity ensures that it will be an adequate solution for both lighter and heavier transport applications, keeping linen and laundry staff safe regardless of how heavy their workload is on a given day. The tugger’s versatility is all in the hitching. Some operations do not own the linen and laundry carts they use, and therefore cannot alter them. That means the carts cannot be motorized. It also means that couplers can’t be added onto the carts, as would normally be done to allow towing. This type of application could benefit from a tugger that can hitch up to a linen and laundry cart and safely steer it along without having to modify the cart in any way. Some organizations in the healthcare and hospitality industries would prefer to transport multiple carts at once in order to maximize productivity and the cost-efficacy of the solution, and tuggers can satisfy that requirement as well. By adding temporary cart-to-cart hitches between the manual carts, again without altering the carts, a single tugger can hitch up to a string of carts and simultaneously transport them all safely and efficiently. Another benefit of the tugger is that it can be moved between multiple manual carts, allowing a single tugger to accommodate different carts and loads with its versatile hitch. A single motorized solution like the tugger keeps costs low, injuries down, and workplace productivity moving forward, which is why our engineering experts find them to be a great solution for linen and laundry applications. Tuggers are just one of several transport strategies for combating MSDs in the workplace. For more information on ways to protect your employees and maximize efficiency at your operation, connect with one of our ergonomic motorized equipment experts via the Contact page.